Cut each watermelon in half lengthwise. Hollow out the insides using a melon baller, reserving rind for later use. Drain pineapple, and discard juice. Cut apples in half, remove cores, and cut into bite size pieces. Peel banana, and slice in to bite size pieces. Rinse grapes under cold running water, and pat dry. In a bowl, toss together the watermelon balls, pineapple, apple, banana chunks, and grapes. 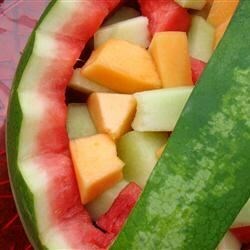 Divide fruit salad among the 4 reserved watermelon "bowls," and serve. What a great idea! I used fresh pineapple, and cooled the salad before serving. Refreshing and full of vitamins! This was OK...nothing special at all. If you want a smaller version to sit on many tables, do the same thing with 1/2 of a fresh pineapple. Very nice recipe!!!! I love it! Left out the bananas and made in large bowl to divide for DH to take to work. Wonderful hot weather treat to help keep him cool. Thanks! Excellent and refreshing summer salad. I make this a lot! It was good, but needs moar watermelon.